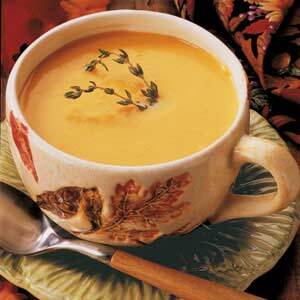 This deep golden soup is as pretty as it is yummy. If you'd like, you can intensify the garlic flavor by adding an extra bulb. The garlic is what really flavors this soup. Preheat oven to 350°. Cut squash into eight large pieces. Place cut side up in a 15x10x1-in. baking pan. Cut 1/4 in. off tops of onion and garlic bulbs (the end that comes to a closed point). Place cut side up in baking pans. Brush with oil; sprinkle with thyme. Cover tightly and bake 45 mins - 1 hour or until vegetables are very tender. Uncover and let stand until lukewarm. Remove peel from squash and onions; remove soft garlic from skins. In a large bowl, combine vegetables, broth and cream. Puree in small batches in a blender until smooth; transfer to a large saucepan. Add parsley, salt and pepper; heat through (do not boil). Garnish with thyme if desired. Yield: 8 servings (2 quarts).